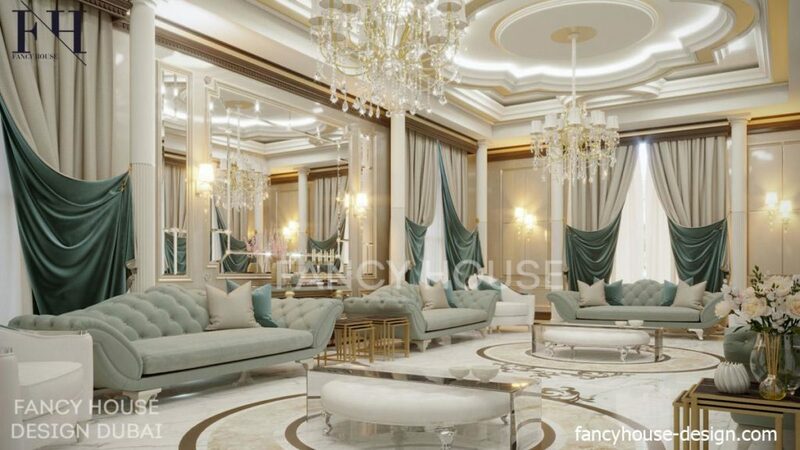 We create bespoke luxury interior design & decorations for a traditional Arabic sitting rooms majlis in modern, classical Islamic styles. A Majlis is one of the most important rooms in the house. It represent the owner to formal guests. That is why majlis design may differ significantly from the private part of the home. Fretworks bring the main decorations in the classical majlis interior design. 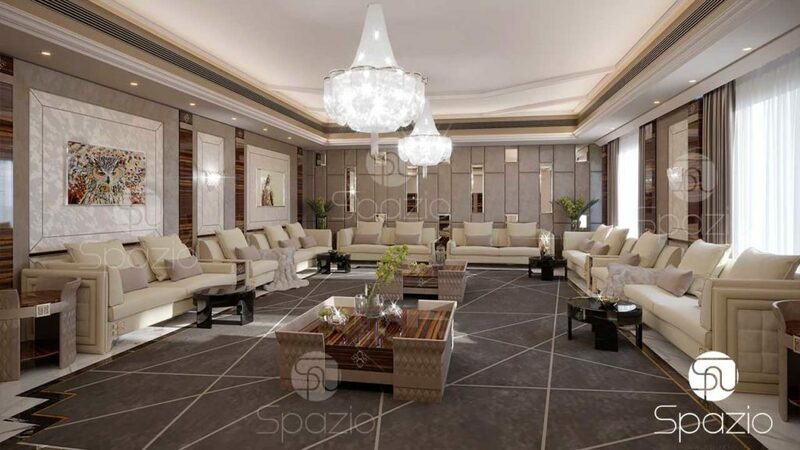 The beauty of the modern majlis design is defined by elegant luxurious textures and patterns. The material and small details that underline the material are the most important. We recommend the use of gold items, gold edgings and narrow strips, carved moldings. A special role plays the ceiling decoration. We create unusual forms and sophisticated decor on it. It is recommended to make maximum high here to provide a feeling of a large beautiful space. The perfect solution is double void and to hand a grand chandelier. We are ready not only to develop a unique interior, but also to fill it with unique furniture manufactured especially for you. Our designer invents items with your family signs. The sitting room appearance will be absolutely unique. An example, we can make embroidery of a family name with gold, silver, beads and other materials. Our designers have a very good taste and can reproduce client’s ideas in a single decorative concept. Interested to get a cost estimation? Email us to know a majlis decoration cost. Each interior is an interesting and exciting story. It should be unique. You traditional sitting can be quite diverse, many styles. You just need a professional designer to combine them to a master piece. Modern lux materials of the majlis sittings. Usually the most expensive finish is used for a house entrance hall and the Majlis. As a rule it is marble stone, onyx, gold, wood, interspersed crystals, real pearls. It often uses sophisticated marble cutting. It is acceptable even if other rooms do not have that. There is a trend to use modern innovative finishes on a par with traditional expensive natural materials. Very big slabs of artificial marble looks gorgeous. 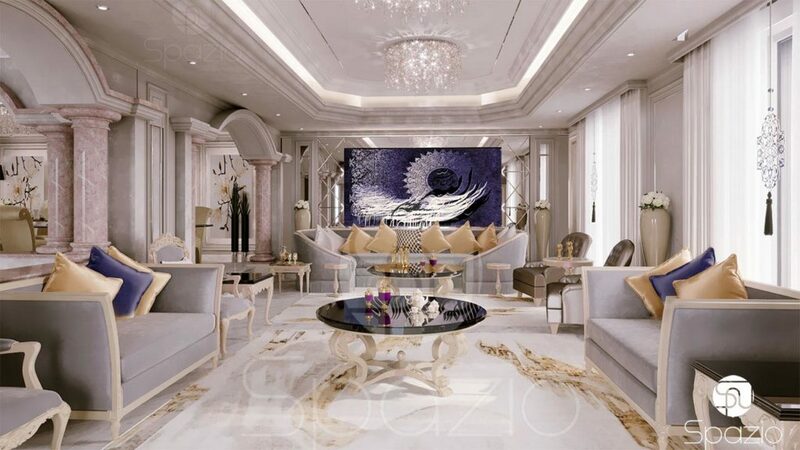 If you prefer classical style we recommend to use new technologies for gypsum decoration, that make it more strong and allow create elegant thin decor. 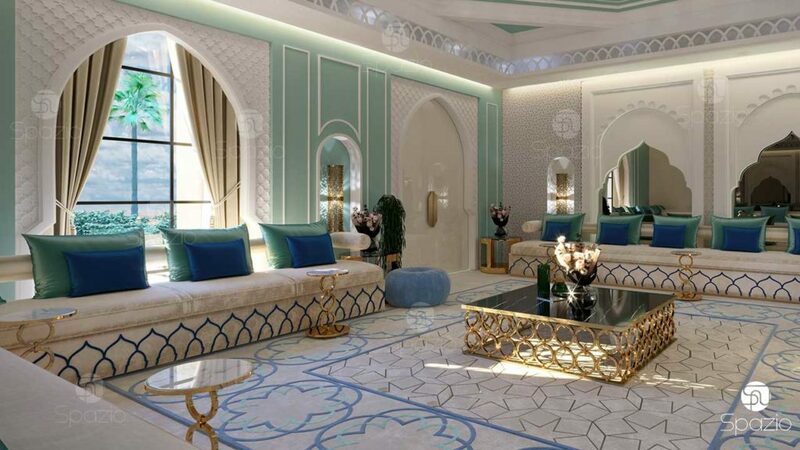 Modern majlis design requires non-standard color transitions and the use of several types of metal: gold, silver and rose gold, platinum, brass. Creating the right color combination is a challenge, that our designers are ready to realize for your home appearance. Our designers have a great experience of creating chic and luxury due to the textures & exclusive details. Each majlis decoration is unique, however, we can give you an approximate cost estimate. Just fill out the form and send it to us. It will be useful if you will drop few lines in the comment form to describe your project. For example, let us know it is a renovation of existing rooms, or a new house. If you have any image of a sitting you love, please send a link to the picture to us.